Shana Koehler and Tee Bender sell T-shirts at the entrance of Kingwood High School so that people can wear them to show their support of pediatric cancer awareness during the Kingwood High School football game on Sept. 6. Kingwood High School plans to “go gold” at the Mustangs’ first home football game at Turner Stadium scheduled for Thursday, Sept. 6. September is National Childhood Cancer Awareness Month and gold is the color assigned to pediatric cancer awareness. Mustangs fans are encouraged to trade Kingwood High’s traditional white and blue garb for gold during the Go Gold Game for Pediatric Cancer Awareness. This inaugural event is coordinated in partnership with three local organizations — Addi’s Faith Foundation, Mothers Against Cancer and the L3 Foundation. 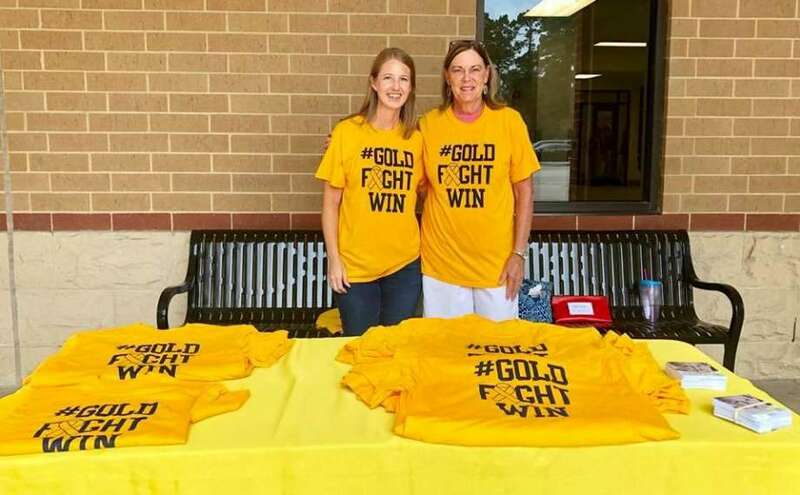 Anyone who wishes to support the fight against childhood cancer and “go gold” may purchase “Gold Fight Win!” T-shirts at Kingwood High School during lunch hour, from 12 to 1 p.m., through Sept. 6. Volunteers will even have a shirt station in front of the main entrance. Shirts will also be available for purchase at the Kingwood Asplaugh’s from 5 to 7 p.m. on Tuesday, Sept. 4, as well as at the football game. All shirt proceeds will benefit the Addi’s Faith Foundation, Mothers Against Cancer and the L3 Foundation in their fight against pediatric cancer. Event organizers say their goal is to have a “sea of gold” at the game, as well as throughout the community during the entire month of September. Koehler said the entire band and cheerleader squad plan to wear the gold shirts and the dance team intends to show their support by wearing gold ribbons. “Imagine the hundreds of students wearing gold across the whole football field — it’s going to make a big statement,” Koehler said. A video about pediatric cancer awareness will be shown at half-time with images and voices of children with cancer and people who support investing more into research and treatments for pediatric cancer. Another Go Gold Game is planned for the Sept. 14 Kingwood High School volleyball match. Plans are also in the works to do Go Gold Games at Riverwood, Creekwood and Atascocita Middle Schools, Koehler said. Event organizers intend to make this an annual occurrence and hope these events spread to even more Humble ISD schools. For more information, visit www.goldfightwin.org.For more information, visit www.goldfightwin.org.